Selecting an antenna to receive HDTV transmissions? It’s the technical equivalent to the San Andreas Fault. Deep down you anticipate a less than perfect picture due to performance imperfection of the first member of the signal processing chain, the HDTV receiving antenna. Keep in mind: digital signals don’t tolerate reflections, which can develop in the air between the transmit and receive site (multipath, ghosting), or on the antenna downlead, caused by mismatch between the receiving antenna and the input of the signal processor. Then 90 or 95% of the HDTV transmitters operate on UHF. Assuming your current UHF receiving antennas are fit for the reception of analog TV signals, are they also proven for the more demanding task of HDTV signal reception? Part I of CATV ANTENNAS FOR HDTV RECEPTION will focus on the issue of antenna downlead mismatch. While 1.5:1 VSWR (14 dB Return Loss) is the common technical standard for antennas to receive analog VHF and UHF stations, the reception of Digital TV transmissions requires a much lower, 1.25:1 or the more desirable 1.15:1 Voltage Standing Wave Ratio (VSWR). Most CATV systems are equipped with impedance match bridges and associated instrumentation to check trunk and distribution cable, or the input/output match of line amplifiers. But how many CATV technicians can claim that they also inspected the impedance match (Return Loss) of their UHF antennas in the 470 to 800 MHz frequency range before releasing them for installation on the tower? Professionally conducted impedance match tests and measurements on UHF antennas may produce disturbing results, as presented on the next page. Pay close attention. These responses were not created by a draftsman. Have you seen the rooftop TV antenna ad promising station pickup up to 200 miles on VHF and 80 miles on UHF? (Estimated range, based on outdoor reception over flat terrain). Now learn about the new fiction: a $50.00 rooftop antenna, covering the entire UHF band, and qualified for HDTV reception. 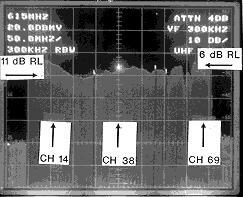 The Polaroid picture above, taken from the screen of the Return Loss measuring system, shows the VSWR (Return Loss) variation in the Channel 14 through Channel 69 frequency range. The $50.00 model, a corner reflector with directors, qualified only in the Channel 35 through Channel 42 limited frequency range. 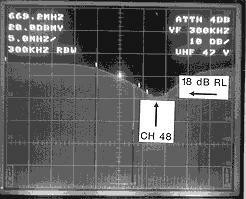 At the low-end of the UHF spectrum, Channel 14 through Channel 27, the antenna had high mismatch, or no match at all. The findings were the same for the high-end of UHF. Testing the $42.00 model of a different manufacturer, the results were totally unacceptable. The photograph below presents a very flat frequency response. However, the best Return Loss value was 11 dB or 1.8:1 VSWR ratio. At the low and high-end of the UHF spectrum the reading was 6 dB Return Loss or below, equivalent to 3.01:1 to 7.0:1 VSWR ratios. These are ideal conditions to produce strong reflections on the antenna downlead, downgrading HDTV picture quality. A poor choice even for the reception of analog signals, notwithstanding Digital TV reception requirements. Quad-arrays of high-gain Yagis should deliver high quality HDTV pictures on selected channels provided, they exhibit good impedance match. An additional advantage: correctly designed UHF phased-arrays can protect HDTV reception against adjacent channel interference. (Traps and bandpass filters don’t have the needed selectivity on UHF). 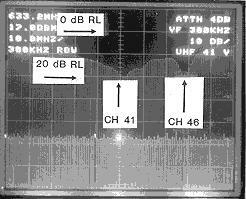 The picture above shows the impedance match characteristics of a Channel 47 quad-array, obtained on the antenna test-range. The array exhibited a satisfactory 18 dB Return Loss (1.29:1 VSWR) impedance match, but on the wrong frequency, Channel 48 video. Another disturbing discovery, the frequency response was not flat within Channel 48. 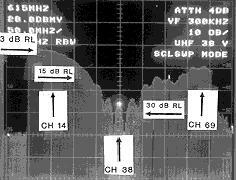 Good HDTV picture quality requires a flat 6 MHz frequency response within the desired channel. Interesting performance deviation was identified on a quad-array, built of two old and two new high-gain Channel 41 Yagis. The impedance match frequency response (See Polaroid picture below) shows two distinctive resonant frequencies. Fortunately, one was on Channel 41 video, but the bandwidth was way below 6 MHz. CATV engineers are waiting with bated breath to see true impedance match characteristics of UHF antenna-arrays, taken on an antenna test-range. PART II deals with UHF ANTENNA RADIATION PATTERNS, affecting DTV picture quality.